Paul Stastny never expected this. 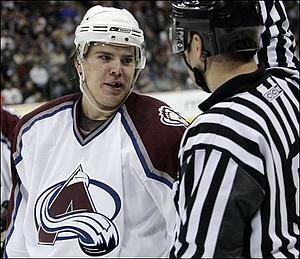 A mere 20 years old and fresh off of two stellar years at the University of Denver, Stastny’s goal entering the Colorado Avalanche’s 2006 training camp was to earn a jersey and some ice time. He never expected his season to end on the NHL’s version of the red carpet. “I just wanted to make the team and shoot for 30 or 40 points,” Stastny says. He did a lot more than that, which is why, on a warm June 14 night in Toronto, the Avalanche center was rubbing elbows with NHL royalty. As a finalist for the Calder Trophy, given to the NHL’s top rookie, he was invited to the NHL awards ceremony that caps off the season. Although he finished second in voting to Pittsburgh’s Evgeni Malkin, it was a banner evening for the 21-year-old Stastny. Not a bad honor for a guy coming into camp just trying to make an impression. He did, making the team out of training camp, and he was one of five Avalanche players to play in all 82 games. He finished third on the team in goals (28) assists (50) and points (78), and was second in rookie scoring in the league. There was one six-week stretch that set Stastny apart from not only the rookie class, but every NHL player. Stastny, already a fan favorite in Colorado, arrived on the NHL map with a rookie-record 20-game scoring streak from Feb. 3 to March 17. It was only the third 20-game scoring streak in the league since 1993-94, and Stastny was the third youngest player in NHL history to have a 20-game scoring streak. Only Wayne Gretzky and Mario Lemieux accomplished the feat at an earlier age. Stastny, who had 11 goals and 18 assists in that 20-game span, said he started feeling more comfortable playing in the NHL in the second half of the season. Now comes the hard part for Stastny – building on a stellar rookie season. Since playing for the United States team in the world championships this spring, Stastny took some time off, but he’s now getting ready for his sophomore season. “I just started working out,” Stastny said the night of the NHL awards ceremony. “I’ll do the same things I’ve done every year, and I’ll add things to get quicker. Stastny knows that he’ll have more attention from fans and opponents. The Avalanche, which narrowly missed the playoffs for the first times since moving to Denver in 1995, came on strong in the last six weeks of the season, going 14-2-2, and Stastny was a big part of that late-season surge. Colorado wants to continue that momentum at the start of 2007-08, and Stastny is conscience that defenses will focus on him more. If Stastny needs any measuring stick, he can look at organizational history. The last four Avalanche players who were on the NHL All-Rookie Team – Forsberg (1995), Drury (1999), Hejduk (1999) and Liles (2004) – followed up those campaigns with even better second seasons. In fact, all but Liles went on to win a Stanley Cup with Colorado. 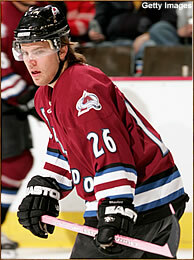 Forsberg won in his second season of 1996 and Drury and Hejduk both lifted the Cup in their third season in 2001. For now, Stastny was happy to be hanging out with the NHL elite. He topped off the NHL awards night by having dinner with one of the best and most respected players in the league – teammate Joe Sakic. “It was a good experience coming here, hanging out with the cream of the crop,” Stastny says. After his outstanding rookie season, some might consider Stastny part of that crop.